Note: Superfluous posts not included. Neither are batteries. I am not a big fan of Chemical cleaners and don't talk much about them, due to some people over using them and damaging stocks. You must always be careful when using a Chemical cleaner. I have found one Chemical cleaner that does not cost much, will remove cosmoline very fast and is not hard on the stock. But first, as always we need a Victim. 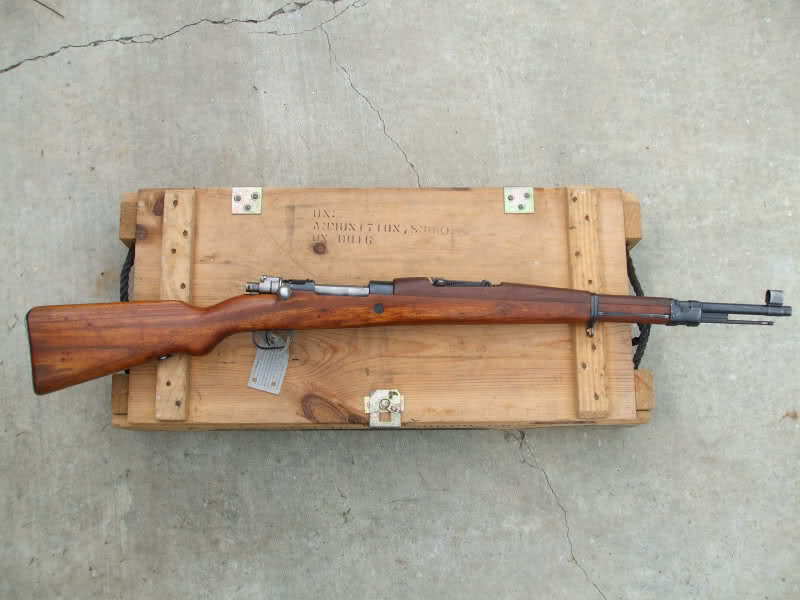 For this post Our victim will be a refurbished Yugo 24/47 in an Elm stock. Here are the reasons I picked this victim. Elm just loves to soak up cosmoline and this one is soaked to the bone. And the other reason is that it's mine and I wanted to clean it up. You need to get the one in the green bottle that is bleach free. 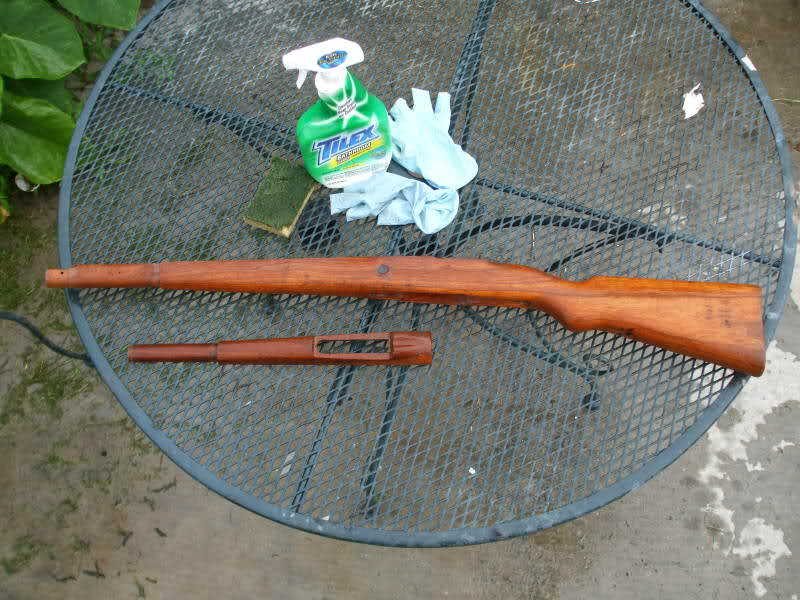 After you remove the rifle from the stock, wipe off as much of the Cosmoline as you can. Spray the stock down very good. 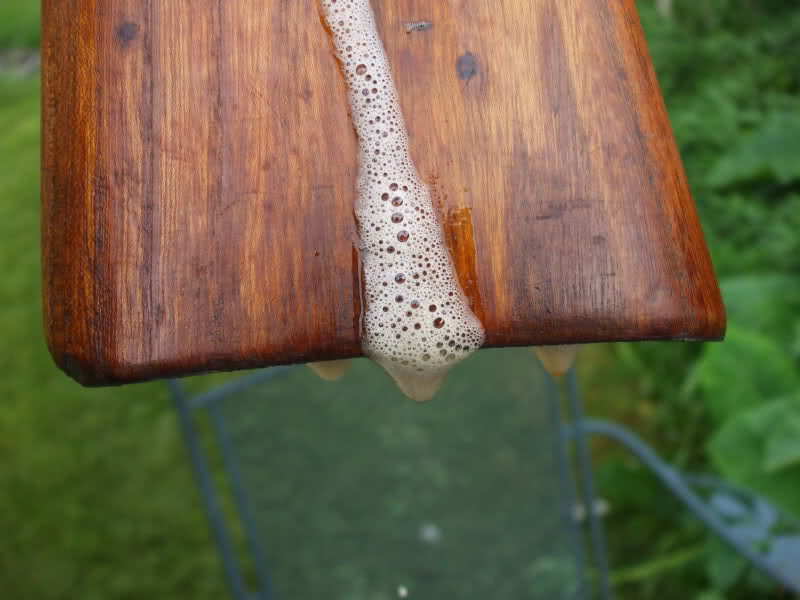 The cleaner is clear and will foam a little when you spray it on the stock. Once it gets on the stock it will start to work. Within seconds it will start to drip off the stock in an orangish brown color, that will be the cosmoline coming off the stock. Do not let the cleaner dry on the stock. Let it sit on the stock for about five min. and then spray it with the cleaner again. Use a soft brush or green pad and lightly scrub the stock. Next you will need to wash off the cleaner with water. Be sure to clean it very good. =; Do not set the stock out in the sun or a hot place to dry. Let it dry in a shaded area to dry for 8 to 12 hours. Now remember that any cleaner will only remove the cosmoline from the surface and some just below the surface. Once the stock is dry you can set it out in the sun, put in black plastic bag or any of the other ways used to heat up a stock. Let it heat up for a day or two to allow soaked in cosmoline to come to the surface. I set the stock in the sun for 2 days. As you can see the soaked in cosmoline came to the surface. I then spray it with the cleaner again. Let it sit for 15 min. and then wash it off with water. Depending on your stock you may have to do this a few times. After I finished cleaning and drying the stock it was time to apply a finish. I applied two Oil Scrubs coats of PTO and one hand rubbed coat. I then applied a top coat of Tom's 1/3 Mix to finish it off. As I said before, I am not a big fan of Chemical cleaners and will only use them on very oily and dirty stocks. If you use a Chemical cleaner be sure to clean the stock very good or you may have trouble when you apply your finish. As always I hope that this helps some of you and if you have any questions, please ask. Lee told me about this method recently and i didn't think much about using it at first. but then i started working on a stock that had soo much oil in it that it actually looked like it had been in a fire, traditional methods did nothing as far as cleaning goes so i finally raided moms cleaning cabinet and brought out the Tilex and it worked great. I agree that it should only be used on a stock that is very very oily. Here is another one I used it on. 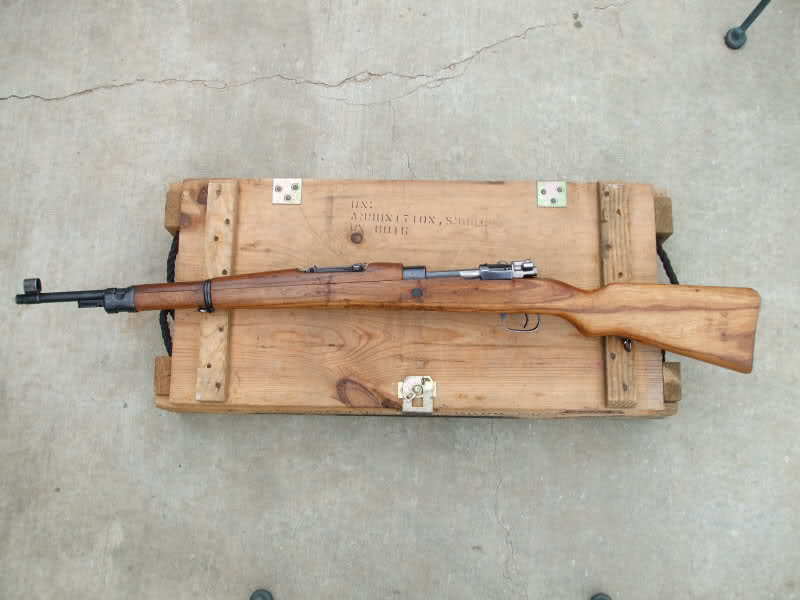 Is this safe for laminated stocks? In the past I've used oven cleaner on REALLY bad stocks with quite a bit of success, but I've read that it shouldn't be used on laminated stocks because it will weaken the glue and potentially cause a failure under recoil - does the same hold true for Tilex? 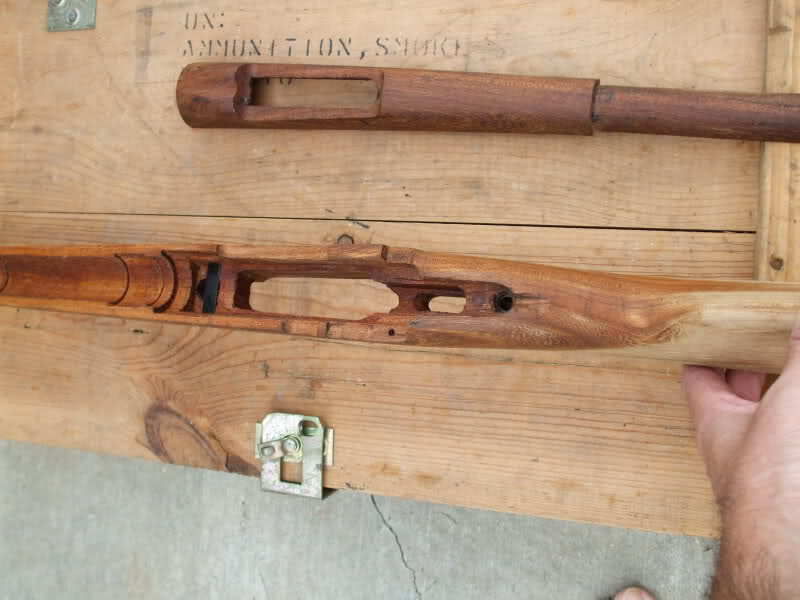 I've been working on a laminated K98 stock for a couple of years that's so badly soaked it just keeps coming, no matter what I do. 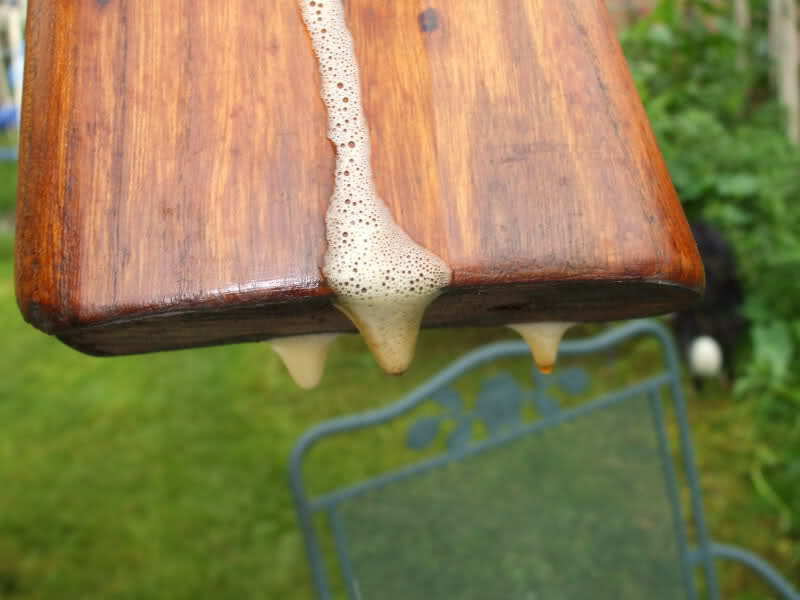 Oven cleaner is bad on all stocks because, it breaks down the natrual glues that hold the wood fibers together. It is just hard on wood. 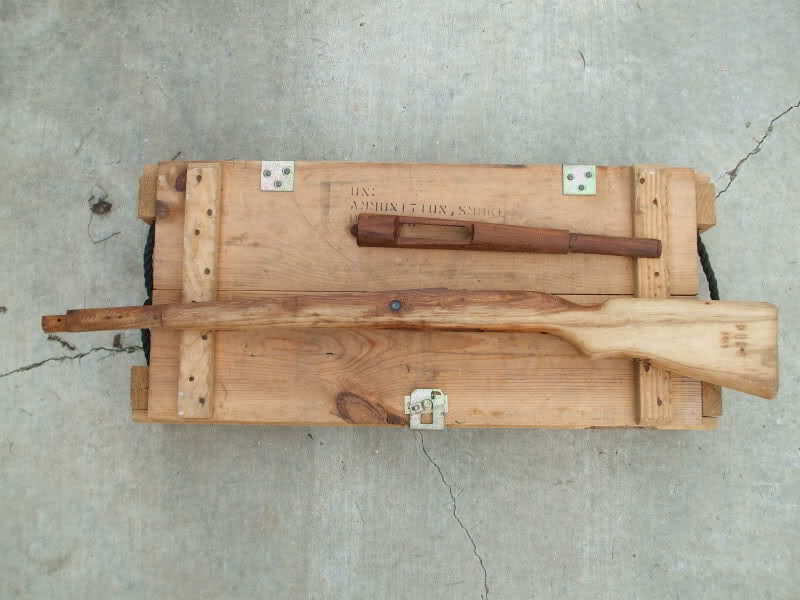 The Tilex is safe to use on laminated stocks. It does not effect the gule. What is Tom's 1/3 mix? Also, is Tilex Green the same stuff as Simple Green cleaner? 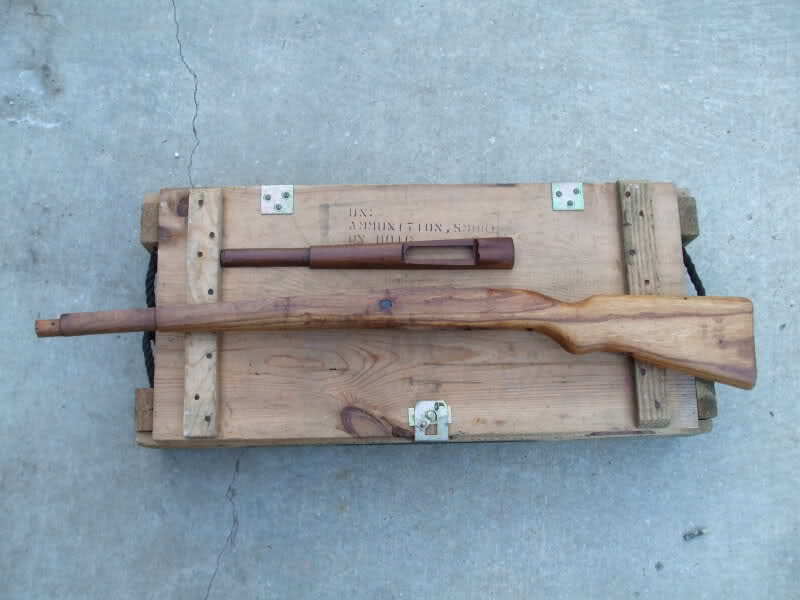 I would use an oil like linseed or just finish it off with satin polyurethane. PTO is Pure Tung Oil. If can be sourced at http://www.realmilkpaint.com/ as well as other places. Another common oil is boiled linseed oil or BLO, which is common at most hardware stores. Tom's 1/3 mix (aka gunny's paste) is a mixture of 1/3 beeswax, 1/3 turpentine, and 1/3 BLO. 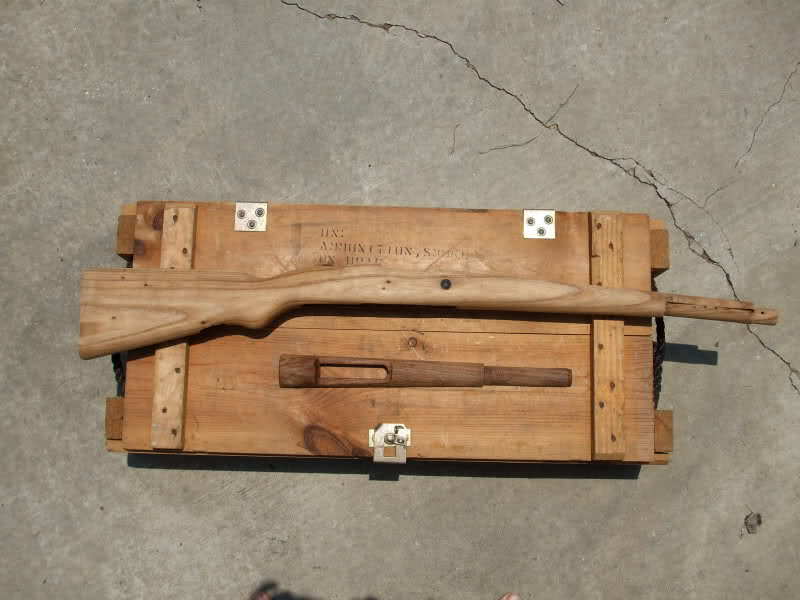 If you have the ingredients, you can make it yourself (method should be readily found via Google), or you can buy it premade from http://www.thegunstockdoctor.com/, who sells the Tom's 1/3 brand. It's good stuff, I've used it several times and really like it. 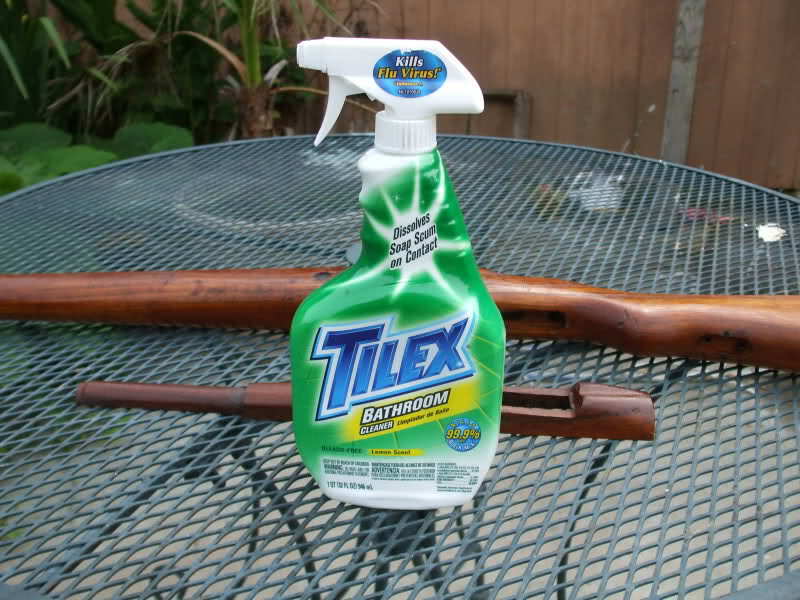 The Tilex green is not the same as Simple Green cleaner. Although I think Simple Green also works well to clean up stocks. Perhaps not as well as the Tilex, but I was able to clean a reasonably greasy stock up pretty easily with it. Apply it with cheesecloth and let it stand 5 minutes or so, and then wipe off the excess with a shop towel. Don't let it stand rtoo long with a lot of BLO on it or it gets sticky. The cheesecloth and shop towels are available at True Value as well. The BLO, cheesecloth, and towels total less than $20. Make sure you wear latex gloves. Also, make sure you let the cheesecloth dry out flat before you throw it away, because it can spontaneously combust until the cheesecloth is dry. Anyway, apply a coat or two, and then let it dry overnight. Then do it again. Then dry overnight. 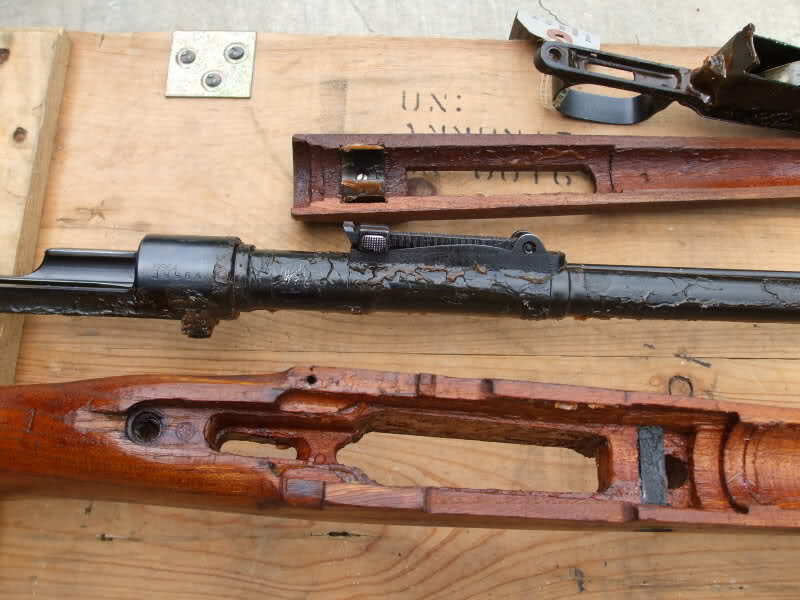 Then I just give it a rubdown with a towel and you are all set- a nice finish that is true to a military gun. I've done BLO by hand - the friction warms up the oil and the wood, even with gloves on, and it soaks right in. Also, I cut my BLO 50/50 with odorless mineral spirits, so it's thinner and soaks in better. I've never worried too much about wearing gloves when using BLO, but that's not to say that I shouldn't. At the very least it'll make cleaning up much easier, and it's never a bad precaution to wear gloves when dealing with chemicals and such. Definitely heed the advice about letting the cloth/rags dry though. BLO will combust if you give it the chance. All in all I think you're friend has given you good advice, and I would also recommend reading up on the various tutorials Candyman and others have posted in this forum and in the reference stickies subforum. 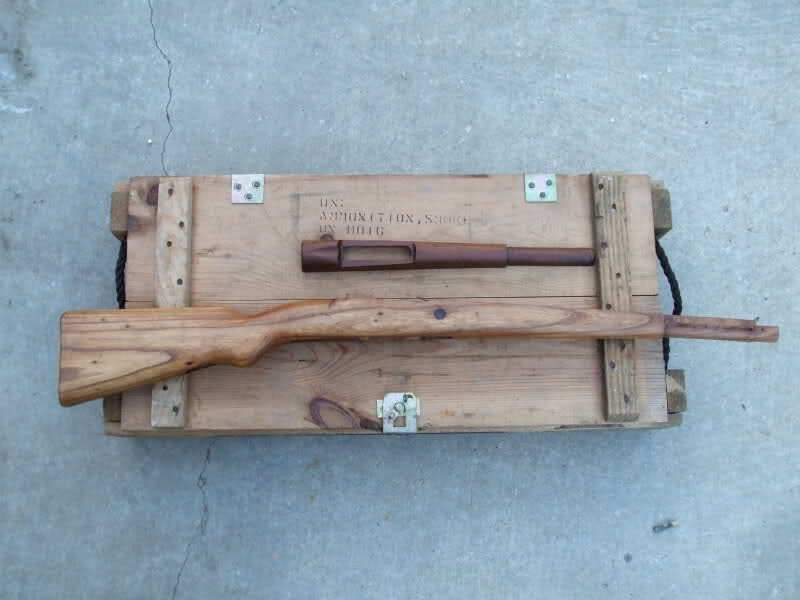 I am working on a walnut M1 stock. It is not just too dark and inconsistent in coloration, after several thorough BLO scrubs I was still getting rivers of thick brown mung coming off. Candyman suggested a chemical clean. Not having any Tilex around, I used Awesome Orange. There's no active ingredients listed, but it didn't smell of chlorine so I thought it would be safe. Sprayed it on and orange-brown stuff immediately began to run off. Let it sit for a minute then scrubbed it with a toothbrush, then rinsed. Only took a few minutes per each wood piece. You'd be surprised how much work you can get done with a toothbrush. The result is great. The wood is now thoroughly cleaned and even in color. The cleaner doesn't seem to have negatively affected the wood, and I discovered a second "P" cartouche under the hand grip. Next,some light sanding, some dent steaming, then an aged-oil finish with BLO finished off with Tom's 1/3. I'm taking pics to document it, so they'll eventually be up. Be sure to allow the stock to sit for a day or two to allwo the soaked in cosmoline come to the surface. If the stock starts to turn dark then it needs some more cleaning. Cosmoline is really much like a crude form of Vaseline. A tad thicker and definitely not as pure. Cosmoline has a low melting point of only 113 - 125 degrees. Its smell is worse than its bite. It is not all that tenacious in that it requires we throw every known caustic chemical known to man at it to remove it. If you plan on having three or more mil-surps or even more you might want to invest in a hand held steamer. (around $50.00 or less at box stores) Get the hand held "cleaning" steamer with the pointed nozzle, not the "wide head" type for removing wrinkles from fabrics. These cleaning steamers generate 180+ degrees of steam heat. Just hold your firearm over a trash can lined with a lawn and leaf bag and steam away. Actually fun! All the cosmoline will run off like melted butter. 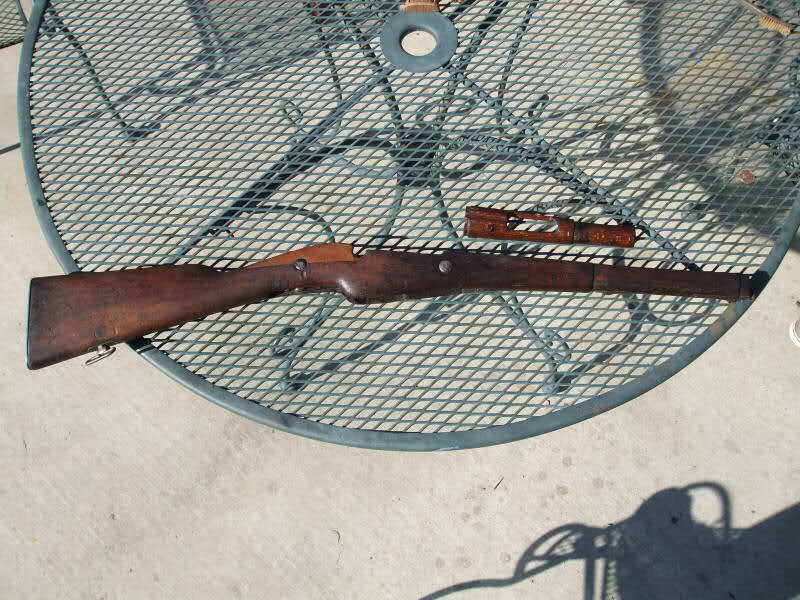 Let the rifle set for a few days and more cosmoline will possibly weep out and then steam it again. Plus the steamer can be used to clean your wife's stove top, shower and tub stalls, and even the rims on your truck. A good investment for cosmo-collectors. Would this method take off the finish? Obviously it would remove an oil finish but what about shellac or urethane. It will not remove shellac or urethane. Just don't let it soak. Purple Power does work, but I find it to be a little too strong. If you use it, just be careful. I washed down my Yugo 24/47 too except I used Krud Kutter. (before I saw this post) It worked really well, too. It says on the label it removes tar, grease, and asphalt. They need to add cosmoline as well. 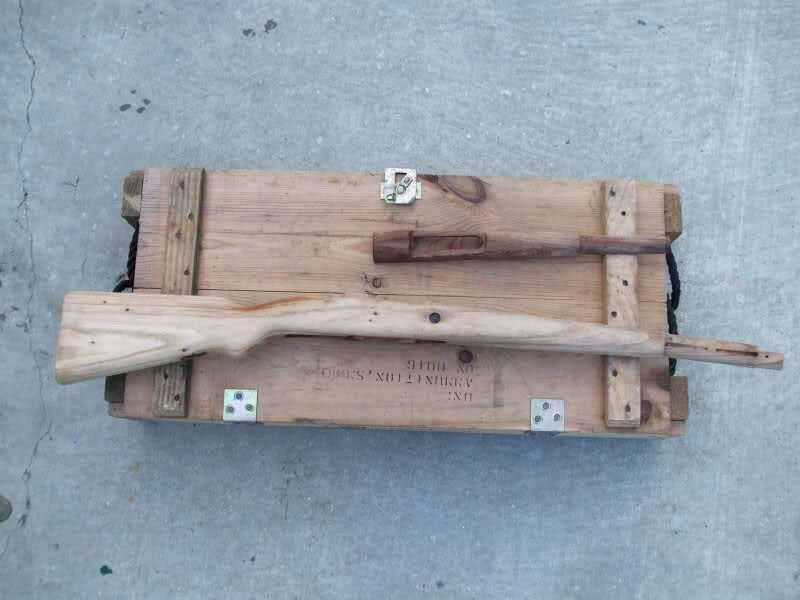 The elm on my stock was B grade at best and rather rough finished at the factory. 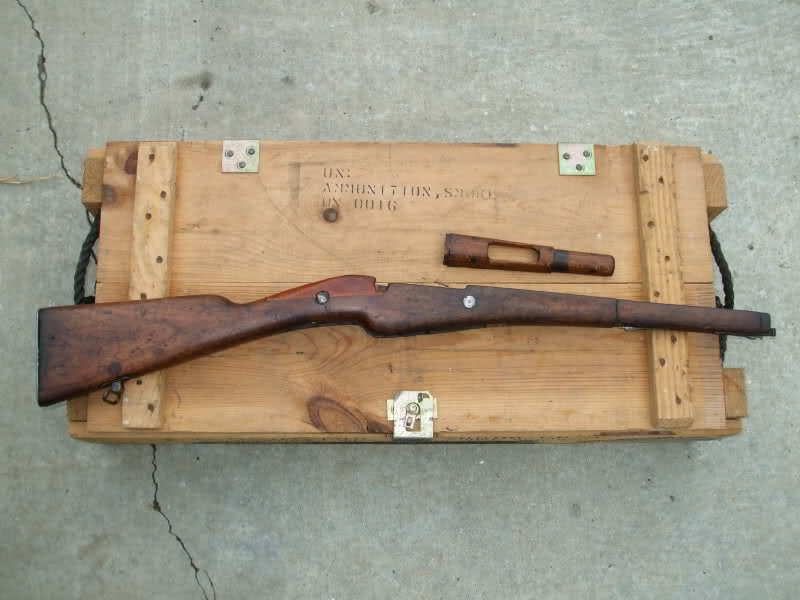 The top hand guard on mine appears to be some sort of oak. Does not match in color. 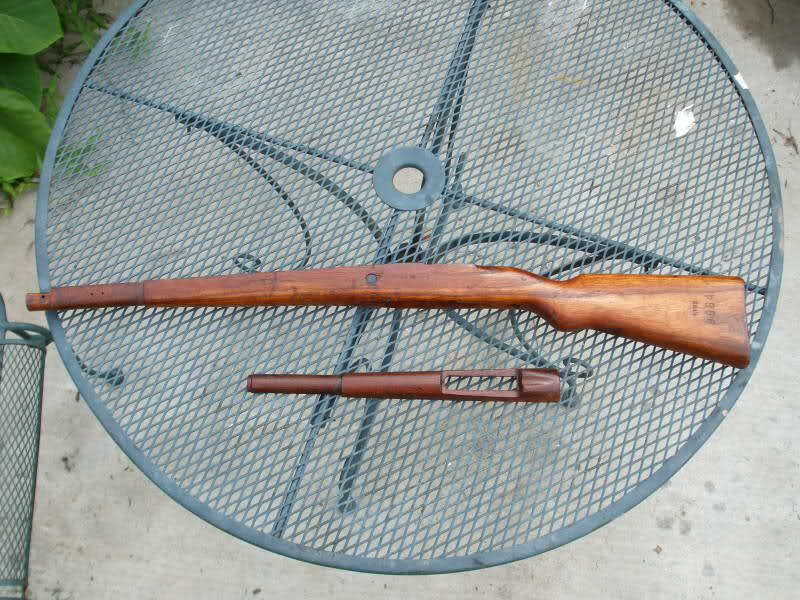 The hand guard is extremely thin on top. There is a barrel band that is screwed inside and it clips on by tension to the barrel. The two screws used to hold it in place look like they came out of a watch! When I reinstalled them and tightened them down one came through the top like a pin prick. I had to remove it and file the point down. I had very similar results using krud kutter. You can pick it up from lowes for about 6 bucks. I used it on my M44 that was soaked in cosmo and it worked wonders. One plus with this cleaner is that it is non toxic. That is cool that you can use tilex too.. I might have to try that on my next gun because I just ran out of krud Kutter!